You are out on another long run. It is a mid-Saturday morning, the weather is a cool 50 degrees, clear skies, and your focus is on the audiobook or podcast playing through your headphones. All of a sudden, out of nowhere, you get this sharp, STABBING, pain on the outside of your knee. Where did this come from? Did you do something wrong? What the heck is happening? If this is your first time dealing with Iliotibial band syndrome, or you are remembering your first experience with it right now, the feeling is all too real. IT Band issues are a frequent occurrence for runners of all abilities, one of the most common conditions we relieve in our office and feel so prevalent that it is almost a ‘right of passage’ of sorts for new runners. In this series, we are going to dive into the details of IT band issues, what causes this dreaded running injury, what you can do about it when it happens to you (It Will! ), and when you need to seek care to help get your training back on track. I can tell you from experience, as a past sufferer of IT band issues myself, it can be stubborn, frustrating, and damaging to your confidence as a runner…but it does not have to be. I tell patients daily that IT Band syndrome is a relatively easy condition to treat…but it requires time, effort, and a change of routine. We start here today by understanding what it is and move through this series to self-treatment and prevention. … and why you can’t just stretch the Iliotibial band and make it better. The Iliotibial tract runs from the hip (iliac crest) to the knee with insertion on the tibia at Gerdy’s Tubercle (trivia!) and is believed to also span some fibers to the outside of the kneecap and head of the fibula. The IT band itself acts as a stabilizer of the lateral knee while also extending, abduct, and laterally rotate the hip when the associated muscles are functioning properly. it is not designed to stretch. Attention must be given to the muscles that make up and act on the IT band. Those would be the Tensor Fascia Latae (TFL) and the Gluteus Maximus (G. Max). If attention is not given to these essential muscles for running that are involved in stability, pelvic balance, and propulsion, they will slowly tighten up, eventually leading to a - multiple month long - process to rid yourself of the stabbing knee pain it can cause. We will discuss the biomechanics and how to address these muscles later in this series, but this is the basics that you must know to help relieve Iliotibial band pain while running. Focus on the muscles…not the band and the site of pain. As described at the beginning of this article, Iliotibial Band Syndrome has a very distinct presentation of pain and discomfort. While the hip tightness is often not recognized, appreciated, or correlated until after we exam someone and describe the nature of their injury, the pain at the side of the knee is unmistakable. So that we have a more tangible understanding of this pain, here is a more succinct description. sharp or burning pain at the lateral joint line of the knee. How common is Iliotibial Band Syndrome? With injury prevalence in runners nearly 50% (Studies suggest 25-65%), IT Band Syndrome is the most common lateral knee injury. 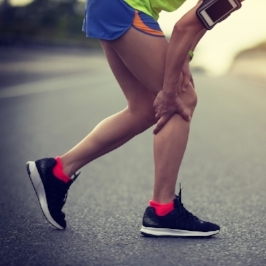 IT Band Syndrome makes up nearly 15% off all running injuries. Studies suggest it is slightly more common in male runners, new runners, and higher volume runners. Clinical experience suggests it is one of the most common injuries runners present to a sports chiropractic office with. Now that we have some understanding of the anatomy and prevalence of Iliotibial Band Syndrome in runners, we will progress our conversation to risks, common causes, and the biomechanics associated with ITBS.